This voluminous one shoulder wedding dress is accented with a Swarovski crystal trim. 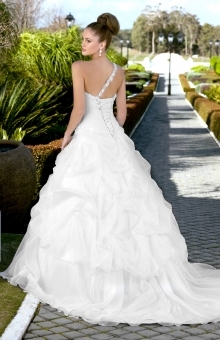 Billowy Soft Organza fabric pickups on the skirt add a whimsical touch. The skirt flows into a chapel train. Lace up or zipper back available.